Pyramid Time Systems presents TTElite Bio, the next generation of its biometric systems for time and attendance. This all new biometric time clock unites a simple to use time and attendance system with biometric technology to quickly identify employees. The state of the art scanner stores a unique finger scan that eliminates costly time theft by preventing “buddy-punching” and the need for time cards, keys or badges. Employees simply place their finger on the scanner to instantly clock in or out of work. 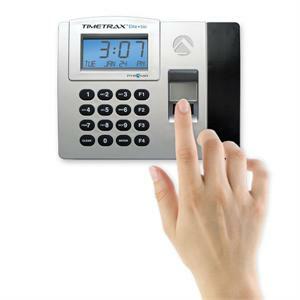 The clock then quickly converts a fingerprint scan to a dot system to indicate unique areas and relative locations. The converted scan is instantly stored in a database and used to authenticate employee finger scans. Enhanced with a keypad, optional manual entry can be set to only be approved by management. Compatible with all major payroll providers the Elite Bio combines powerful Microsoft Windows based software for flexible payroll management, unlimited pay categories, reporting, & exporting with the latest fingerprint scanning intelligence on the market for undisputable and reliable employee tracking. Upgradeable to unlimited number of employees (6,000 punches per terminal, per download) the TTElite Bio comes ready to use for 50 employees & empowers organizations with a multitude of payroll management features, multi-terminal capacity, and plug & play simplicity. Uses biometric finger scan technology to eliminate costly "buddy punching"
Microsoft Windows based software for flexible payroll management, reporting, & exporting. System Requirements: Windows , XP, Vista & Windws 7 single pc software, not server. TimeTrax software is single user. PC-300 MHz Pentium Processor, Memory - 512 MB of RAM, Free Space- 1 GB. Internet Explorer 5.0 or higher, CD-ROM 4x or faster.